What Was The Volkswagen Golf Harlequin? Special-edition, limited-run vehicles have long been a part of most automakers’ bag of sales-boosting tricks. Producing a limited number of specially trimmed examples of a given vehicle—unique paint, wheels, interior and exterior trim, and maybe some stripes or special emblems—is a relatively easy, cost-effective way to drum up a little excitement over a given model line without incurring the significant expenses of a serious styling update or mechanical refresh. The special-edition model is a time-honored practice that has been going on in one form or another since the Fifties. For 2017, for example, Nissan rolled out its Midnight Edition cars clad in silver paint with black trim bits. 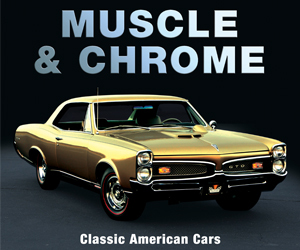 Around the same time, Chevrolet introduced a series of Redline models, each of which differed from rank-and-file variants thanks to unique wheels, paint, and badges. For the most part, special-edition vehicles are only available for a single model year, and generally don’t cost much more than the core vehicle on which they are based. All things considered, they typically aren’t really all that special—just a little different/flashier from everything else on the dealer lot, which is often enough to help move a few extra cars. Every now and then, however, a carmaker goes a little over the top with special-edition vehicle, and we can only applaud the break from routine. 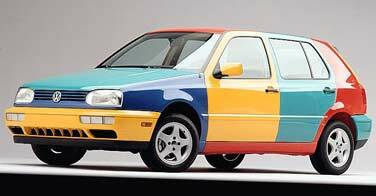 One such special edition that went way beyond normal boundaries was the 1996 Volkswagen Golf Harlequin—a limited-run model with an eye-grabbing paint…uh, treatment achieved by swapping multicolored body panels onto a single car at the factory. 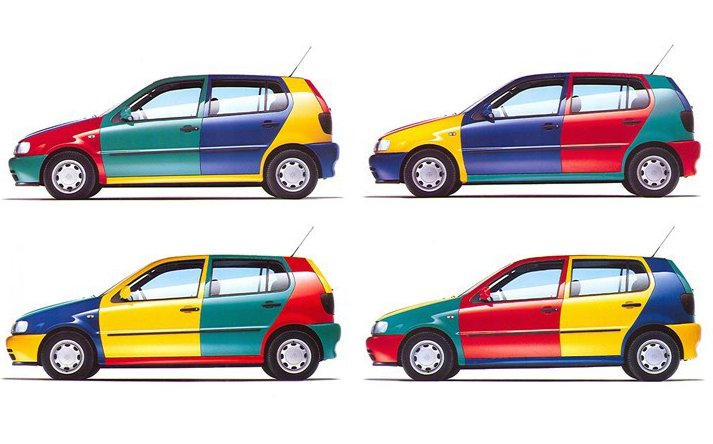 Following the success of the European-market VW Polo in Harlequin guise, Volkswagen built four Golf models in the same multicolor motif for use on the 1995 auto-show circuit. American VW executives found the show cars utterly charming, and immediately ordered 60 examples for retail sale. Dealers responded promptly, snapping up all 60 and pressing VW for more Harlequins. Another run of at least 200 examples was approved, a number of which were sent to Canada and Mexico as well. 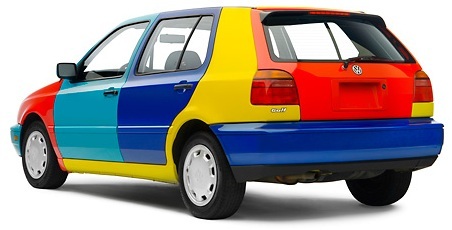 The European-market Volkswagen Polo also got the Harlequin treatment. The Golf and Polo were available in the same four color combinations, as seen here. Harlequins were built in batches of four, starting life as single-color cars in Tornado Red, Ginster Yellow, Chagall Blue, and Pistachio Green. Doors, hatches, hoods, and fenders were swapped manually, making the process fairly labor intensive. There were only four color combinations, each batch consisting of one of each. Two of the colors, Chagall Blue and Pistachio Green, were not otherwise available on Golfs in North America. All harlequins had the original donor car’s roof, C-pillar, and rocker panel, as these elements were formed of a single welded piece and were impossible to swap out. The color of the roof was used for license and registration purposes. All Golf Harlequins came with grey interiors. The Harlequin treatment was a $150 option. All Harlequins were based on the GL trim level, and thus came only with a 115-horsepower 2.0-liter engine. No word on how many were built with manual transmissions. With manual transmission, a Golf Harlequin would have started at $13,725. With automatic transmission, air conditioning, antilock brakes, and a CD changer, the Golf Harlequin listed for $16,730. While that initial run of 60 Golf Harlequins wasn’t enough for VW dealers, the additional batch of 200 or so was apparently a few too many. Rumor has it that at least a few Harlequins were swapped back to single-color status at the dealership to help move them off the lot. However popular the Harlequin was in 1996, there is a healthy interest in the car today. For more information on this bizarre and wonderful respite from ordinary mainstream autos, check out the Harlequin Registry. Written by: Tom Appel on December 18, 2017.on January 9, 2019. What Was The “Uncle Buck” Car?